Back in January/February my friends and I decided we were going to drive to Minneapolis for AWP. Yes, drive all the way from Virginia to Minnesota. It went surprisingly well. On the way there we stopped in Dayton, Ohio, for Skyline Chili (Cincinnati chili represent!) and I always love driving past the windmill fields in Indiana. We arrived in Saint Paul around 3am the day of the conference. An alumna of my program was kind enough to let us stay with her, and she had tasty carrot/apple/ginger juice waiting for us. 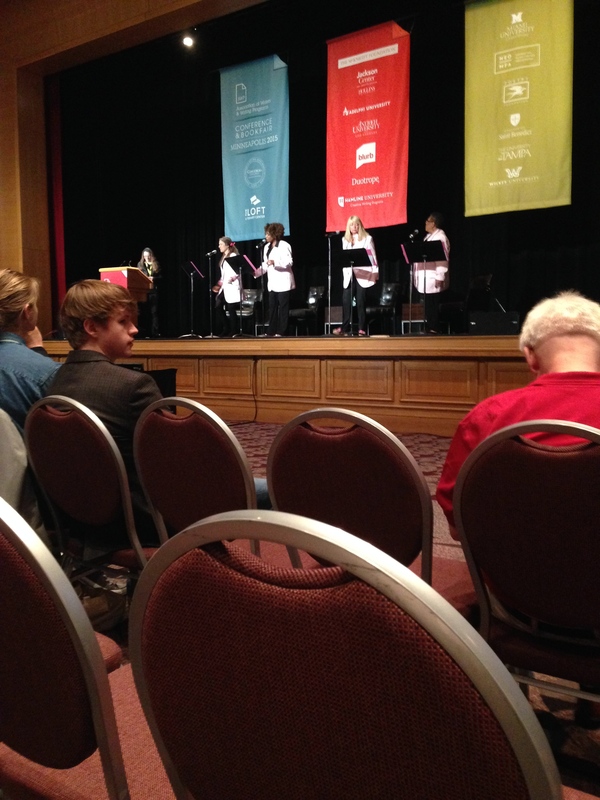 I reluctantly woke up a few hours later and headed off to the Graywolf Poetry Reading. Nick Flynn and Matthea Harvey were great, of course. I’d never read any of Mary Jo Bang’s or Katie Ford’s poetry before but I enjoyed them too. Then I got to see my wonderful professor Rita Dove sing poetry set to doo-wop. She performed with Sophie Cabot Black, Carol Muske-Dukes and Marilyn Nelson. My personal favorite was Plath’s “Daddy” sung to the tune of “Dream Lover.” That night I saw Anne Carson, Marie Howe, and Claudia Rankine and holy crap was it good. I swore up and down this year I wouldn’t go to any panels, only readings. Well, I did end up attending one on Friday—Extremophillia: Defining a Poetics of the Extreme. I went to hear Beth Bachmann and Nick Flynn and walked out of the panel in love with Jamaal May and Tarfia Faizullah’s work as well. Much better than most of the boring panels I went to in Seattle. Did I mention it also snowed that day? Ugh. I don’t want to take too long with this post because I can’t imagine it’s particularly interesting for y’all to read. On Saturday I heard the tail end of Roxanne Gay’s reading/discussion. Then I saw Mary Szybist and Linda Hogan read. I also got to say hello to Mary Ann Samyn. I hadn’t spoken to her in person for two years so it was nice to chat for a minute. Most of my book fair wandering happened on Saturday which turned out to be a bad idea. I got ridiculously bad allergies in Minneapolis which kept me from visiting all of the tables in the book fair. I spent the last of my Saturday afternoon at the conference sitting upstairs by myself, trying to get my sinuses to calm down. I did manage to say hello to a few friends and stop by the Phantom Books and DIAGRAM tables. Seeing the sunrise in Wisconsin was the perfect ending to my trip. Can’t wait for next year!